The I Spy TV show was a 60 minute spy action series on NBC. Using their "covers" as a professional tennis player and his trainer, a dynamic duo of hip U.S. secret agents roam the world saving the nation and its friends from petty dictators and other bad guys everywhere. It's espionage with a comedic twist. These guys are so smooth that their poor adversaries don't have a chance! I Spy was the first TV show to have an Afro-American star cast in a heroic role! Bill Cosby has a Doctorate in Education from the University of Massachusetts. His doctoral thesis was titled, "The Integration of Visual Media via Fat Albert and the Cosby Kids into the Elementary Schools Culminating as a Teacher Aid to Achieve Increased Learning". Thirteen years after appearing as a U.S. secret agent in I Spy, Robert Culp was cast in the role of an FBI agent in "The Greatest American Hero". Actually, the rugged schedule of shooting I Spy caused him on many occasions to say that he didn't even want to see scripts for TV pilots. A friend convinced him to change his mind for "The Greatest American Hero". Bill Cosby won three Emmys for his portrayal of Alexander Scott in 1966, 1967 and 1968! His wife, Camille Hanks, is a direct descendant of Nancy Hanks ... Abraham Lincoln's mother. Robert Culp not only starred as Kelly Robinson, he also wrote the scripts for seven of the episodes one of which won an Emmy! He actually started writing scripts during his first series ... "Trackdown (1957)". In episode #70, "Home to Judgement", Culp used his Grandfather as inspiration for the character "Uncle Harry". Later on "The Greatest American Hero", his grandfather would be his inspiration for his role of "Bill Maxwell". Culp also directed some episodes and choreographed his own stunts! 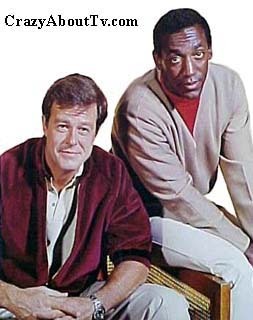 Bill Cosby and Robert Culp had no idea whatsoever about what the other one had done in the business until they met for the first time to read the first "I Spy" script! You may also want to check out these other Bill Cosby series: "The Cosby Show (1984)", "Cosby Mysteries (1994)", and "Cosby" (1996). Thank you for visiting our I Spy TV show page!